It’s been quite a while since I built my first bonsai, so it was time for another try. Though, this build is more the result of testing out two different techniques, rather than an attempt at creating a complete piece. The first technique is the brick pattern of the pot, which is something I’ve been fiddling with for a while. I wanted to use 1×3 tiles rather than 1×2, which seems to be the norm, to represent the bricks as it fits better with real measurements. Of course, 1×2 tiles have the huge advantage in that it can slide on a single stud to any position, while the 1×3 tile has only 3 positions (5 if you use hollow studs). I wanted to make a technique using 1×3 tiles, with a halfplate offset between bricks in all directions, which made for quite a challenge. The result fits the bill, but is a bit on the inflexible side, and quite messy in the back. The second technique is the tree trunk. I’ve seen similar things done here and there and I wanted to try it for myself. 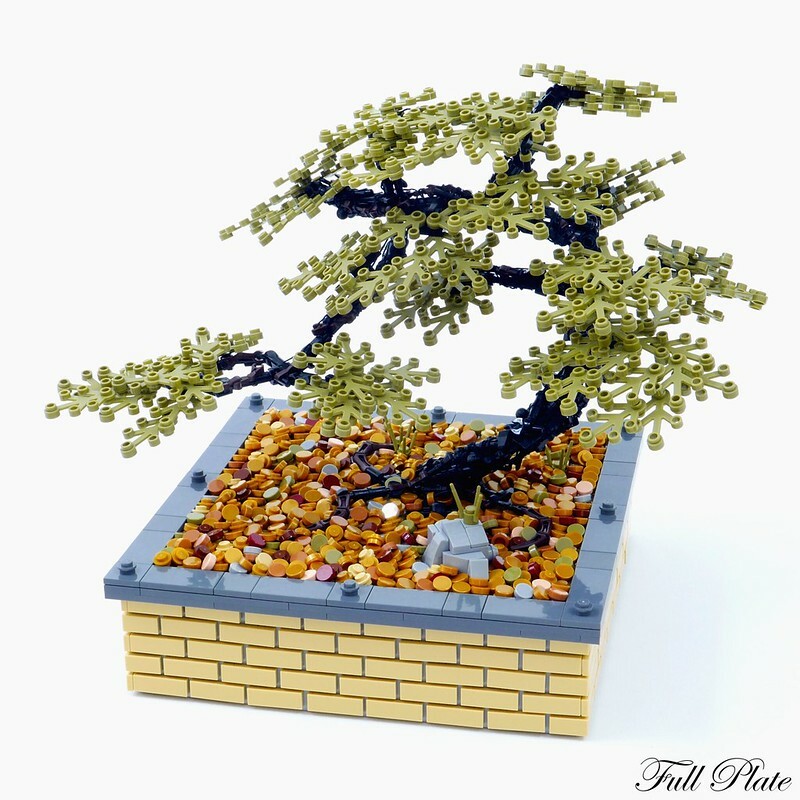 Basically it’s a tree built by technique connectors with a bunch of debris tied to it with lego strings. It’s quite tedious and you can’t really follow a formula, but after a while it becomes a bit clearer which pieces fits where.